Thank you to those that attended either the Beginner or Advanced SEO sessions at BlogPaws 2017! I sincerely hope you got SOMETHING out of the sessions that you were able to take back and implement on your own websites. I will keep this page updated with new links to tutorials that I will be creating to further outline each of the items we discussed at the conference as well as questions that were asked after the sessions. If you have questions – or concerns about any of the below please do not hesitate to contact me and I will do my best to help! WHY YOU SHOULD CARE ABOUT SEO & ORGANIC REACH! Organic search is a key component to online success! Reach a new audience – gain new subscribers – build new relationships, for free! 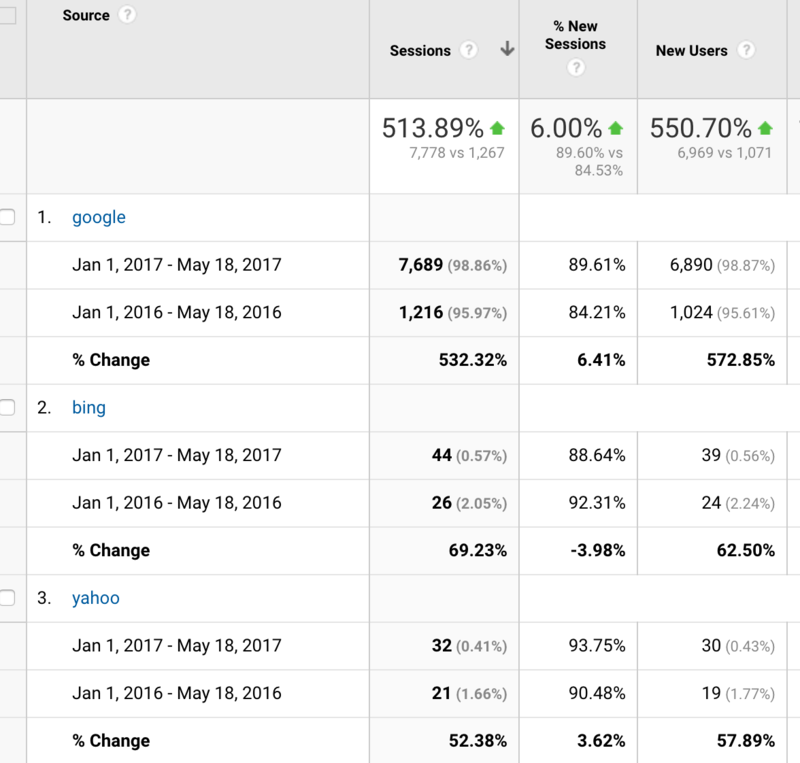 We like free traffic……and check out the kind of results you can see in organic traffic growth by implementing some of the things we reviewed and retraining your brain a bit to think like you audience! 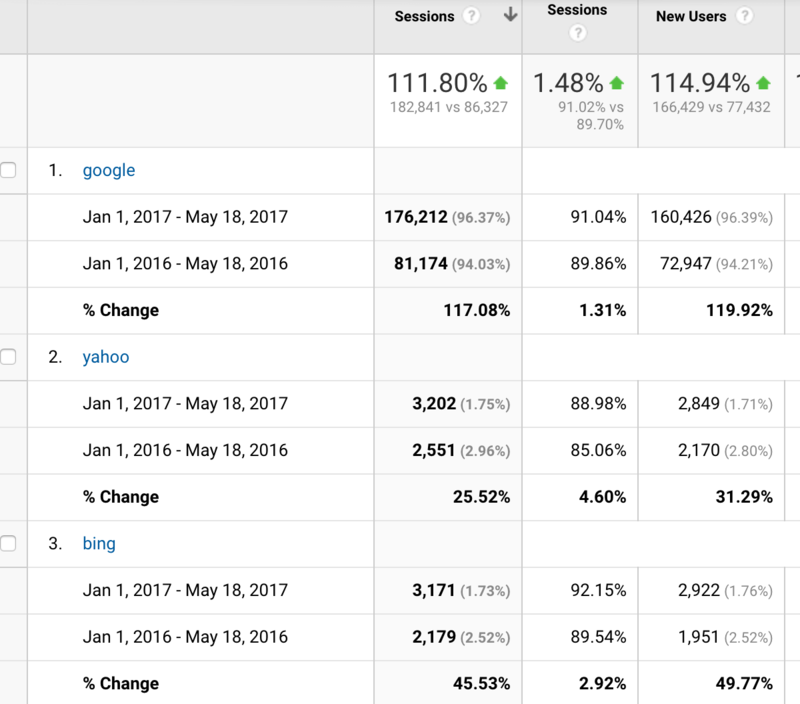 These 2 examples are website growth statistics JUST FROM BLOGGING! GOOGLE ANALYTICS – IT IS DOG GONE IMPORTANT! Here is where we will do a quick review of analytics and what bloggers should be reviewing to understand their visitors and how to improve their content and user experience. If there is one thing you should incorporate into your weekly workload – it is analyzing your data! GOOGLE WEBMASTER TOOLS/SEARCH CONSOLE – A GOOD ADDICTION TO HAVE! If your website is not hooked into Google Webmaster Tools — do it NOW! It takes 2 minutes and will give you data you cannot find anywhere else! Learn the terms your rank for, what Schema and markup is valid for your site and about your internal/external linking strategy. Using this data you can improve your existing content….and I will show you how! Find the keywords you rank for – look for those that rank well but have low CTR rates – optimize those posts. We will discuss more below. Find most popular pages filter pages / queries to find all the keywords for each page. QUALITY OVER QUANTITY – USER USER USER! Multimedia – and optimize it! WRITING ARTICLES BASED ON WHAT READERS WANT! Visit Q&A websites to look for questions being asked to inspire you to write relevant content! Let’s write a post! Thank you to Bernard of Graffiti Dog for letting me use his brand new website as an example! 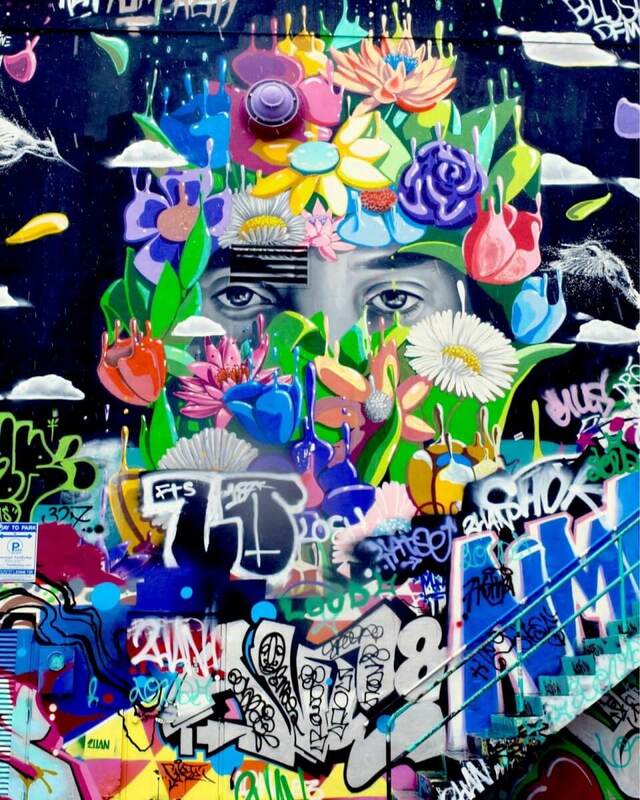 He shared a story about this image with me Thursday night which inspired me to include this section into my presentation…..the image represents a combination of graffiti inspired art from what is a traditional style to a the artists own beautiful interpretation of it. So – during our conversation I asked Bernard a couple of questions…..
What is your 3 year plan for your blog. Where do you want to be – who do you want to connect with. Who is your perfect reader? What type of person will be most interested in your blog…. This image makes a PERFECT blog post though and I wanted to share how I would approach this post if I were Bernard and why. Go to Google – type in “street art” – look at the top listings, what appears in the drop down and search related to at the bottom of the page….these will give you some inspiration about what people are looking for. Here I can instantly see “Street Art history” in the related search at the bottom…which ties in PERFECTLY with the image. Title of my post can then be “The History of Street Art” — he can add in his town if he wants to keep it local. Then to find additional “topics” related to your core title topic – go to answer the public and type in “street art” — then you can see questions who what where when why. I can instantly see “what did street art used to be called”, “who invented graffiti street art”, “where did street are originate” – all of these can then become H2 header tag questions and Bernard can answer each of them. You can also get additional post ideas from that same search…….BONUS! How does Google know what the searcher wants – recipes, diet plans, health information, is it right for their dog etc? So in this example we want to help people understand how to transition their dog to a raw diet from an existing diet they have. So we want this to be oriented at people who want to make the change……so we need to create content around variations of this topic….so you will want to find related topics that are also being searched and utilize the phrases in your post….. The knowledge graph is a system that Google created that allows them to take data from your website to provide answers instead of just links in the search results. It pulls the information from what is called “structured data or schema markup”. Appearing in Knowledge Graph is NOT guaranteed and there is no way to get yourself included.